Come along as we create TURKEYS! 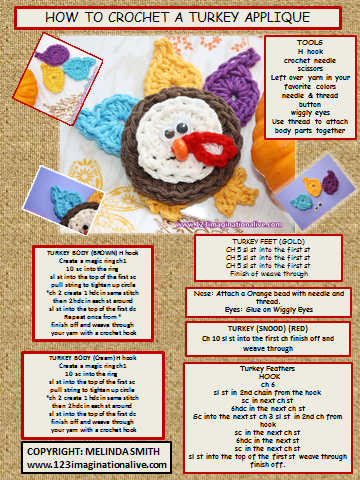 A step by step guide to crochet turkeys for your FALL gatherings! You will be able to work from this page using the my crochet pattern or you can print a copy for your pattern stash! Scroll down for a large view of this pattern. How cute is this little TURKEY? He is just hanging out waiting for Thanksgiving Day! He might be a guest on your dinner table but not as the main course. He will be tucked in a dish or be used as a placeholder. Can you imagine Grandma's surprise when she sees this little guy waiting for her on her plate? This crochet pattern is a great way to use up leftover yarns. Cotton or acrylic work just fine. Yes, the red part is call a "SNOOD". I encourage you to play around with different feather colors, maybe even a variegated yarn. We added two different size eyes so our little Turkey would look goofy. 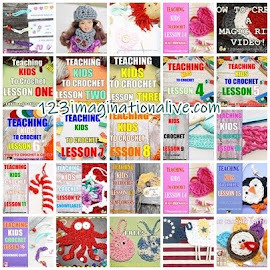 This crochet project is perfect for beginners and children. You can find easy crochet lessons on my YOU TUBE channel HERE! 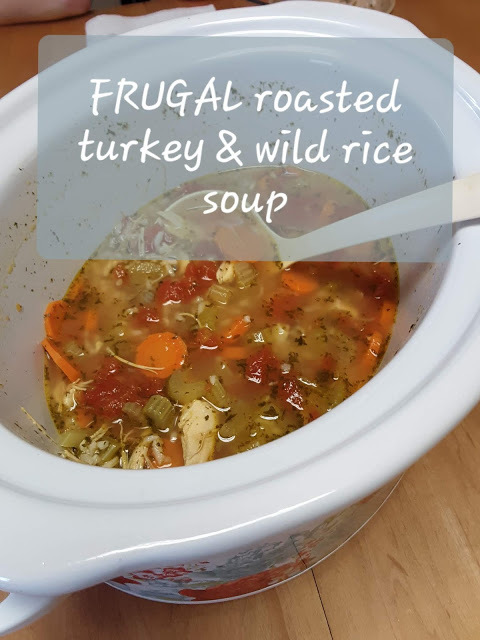 These little feathers work up quick and make the Turkey bright with lots bright of colors! 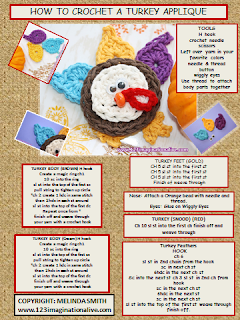 You can create your TURKEY APPLIQUE with this pattern below. You can print your PDF copy at the bottom of this page! Feel free to share this pattern. It may be used for craft projects and can be sold in venues and shops. I do ask that you link it back to my blog. Thanks. You can use these little turkeys for Fall decor, place settings, party favors, bunting applications, crochet projects and much more! Below is a preview of what your pattern will look like when it is printed. 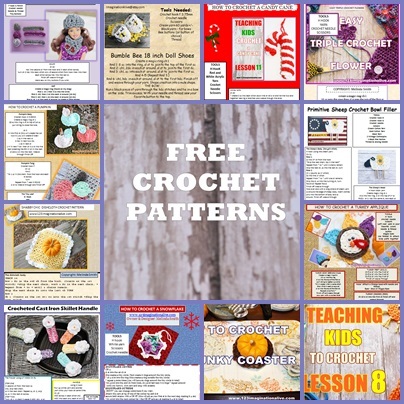 Your can find more FREE crochet patterns on my blog HERE! 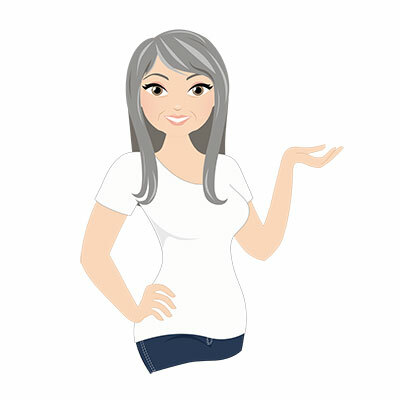 Never miss a FREEBIE, subscribe to my FACEBOOK PAGE HERE! 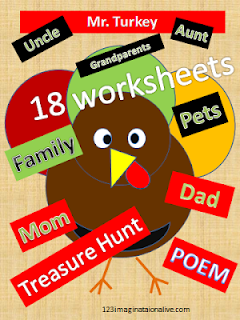 Looking for more fun Fall ideas, print your FREE Turkey worksheets HERE! Thanks for stopping by! Happy Crocheting! If you have questions about my blog or a pattern feel free to contact me through email at the top of the blog.